The typewriter can be used for more than just lines on the page. Many artists use typewriters to draw pictures, create designs and more. 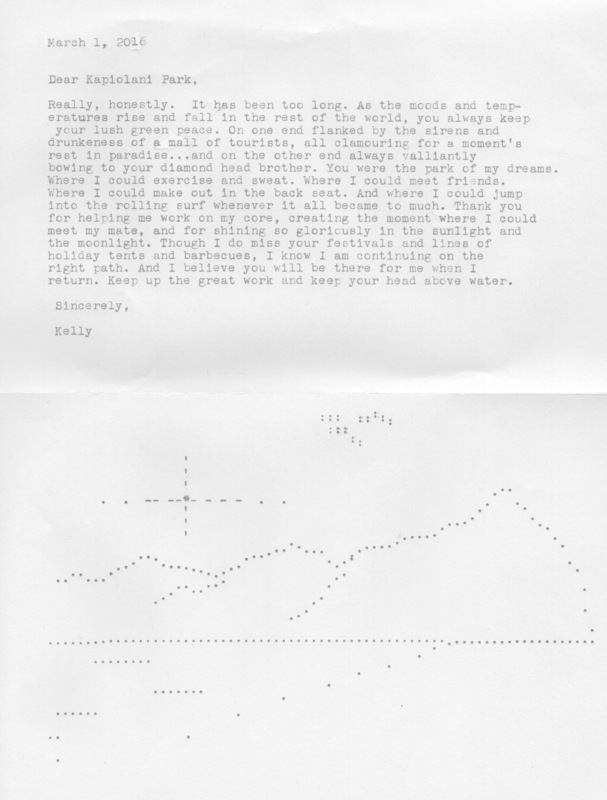 With Letters of Place we explore the letter format and combine it with some basic typewriter art in the discovery of place. The question is, “What is a place you especially love or despise?” Additionally, “How would you describe this place and how would you represent it on the page? The Solo Practice: The participant types the letter themselves. Use this technique (instead of The Type Bar Practice of dictation) to explore type art on the page. Pick some place that has special meaning to you at the moment and that will give you ample material to type about. Divide a full sheet of paper in half with a fold or a pencil line before you insert it in the typewriter. On one side of the fold (whether above, below, right or left of the fold does not matter), write a letter to the place. This may be in any form you are inspired to use. You can give yourself a timed write if it helps you to get the thoughts down. Five to seven minutes should be plenty. Once you have written about the place, move to the other side of the fold. Use the techniques in “The Anatomy and Physiology of the Typewriter” to paint a picture of the place you’ve described. Give yourself more time to complete this. Sign and mail the letter to yourself, or to anyone who may share your place with you.